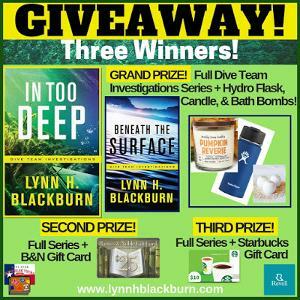 Prize: Grand Prize: Print Copies of Both Books in the Dive Team Investigations Series + Hydro Flask, Candle, & Bath Bombs; 2nd Prize: Print Copies of the Series + $25 B&N Gift Card; 3rd Prize: Print Copies of the Series + $10 Starbucks Gift Card. Statistics: This contest was opened by 25 and entered by 3 ContestChest.com members. 12% of those who opened the contest, entered it.